The Cardiff World Half Marathon Championships was supposed to be my wife’s time to shine. It was to be her first half marathon and we were going to get her round in under 2 hours. However, it wasn’t to be. A couple of weeks before the race Victoria started to feel unwell. When it hadn’t cleared up after a week she was given antibiotics by the Doctor. We were hopeful that these would work quickly and she would still be able to run. However, half way through the week, with very little improvement, we made the decision that she wouldn’t be able to run. 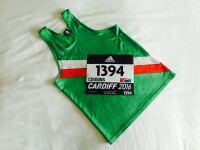 As it happened, she wasn’t even able to accompany me to Cardiff to spectate. She was gutted, but it was the right decision. There will be other races. 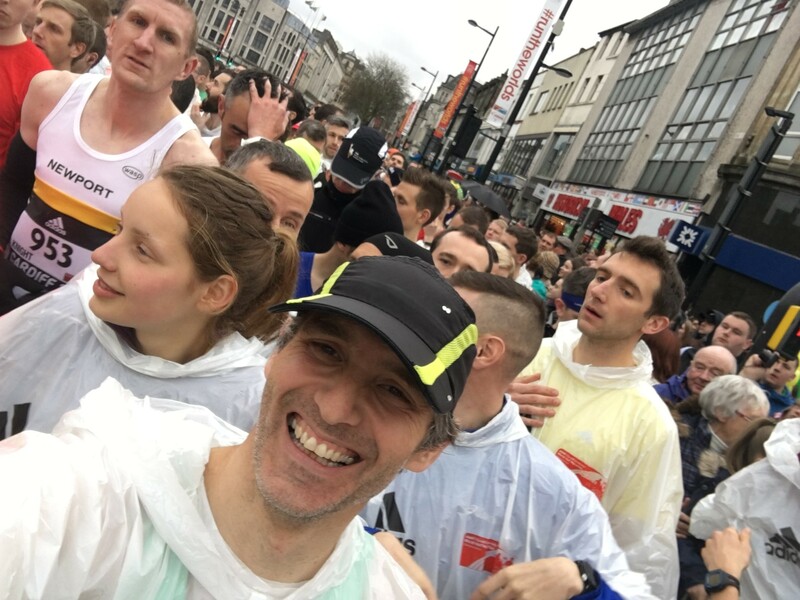 I write this race report, the day after the race, sitting in an out of hours surgery waiting with my wife to see another Doctor, as the antibiotics course is nearly at an end. 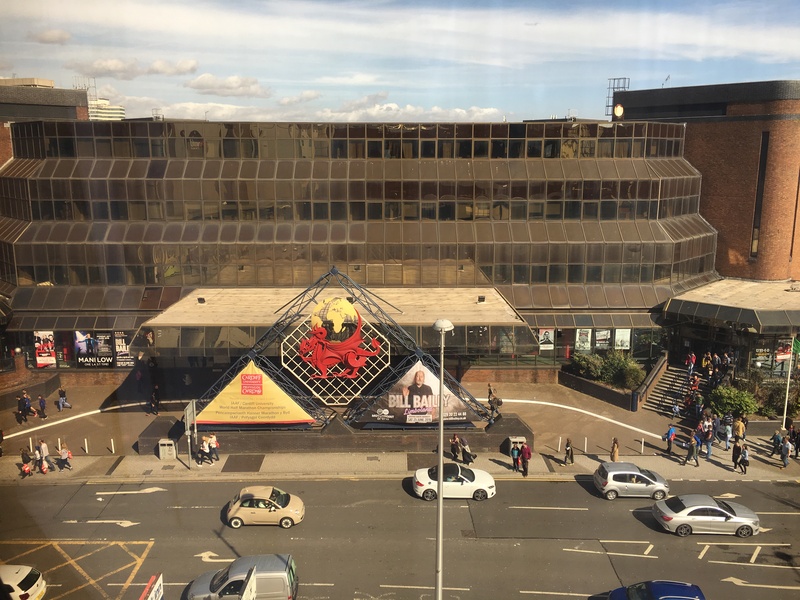 I arrived in Cardiff on a sunny day, the beauty of which belied what we knew was to come the following day. Cardiff is quite a compact city. 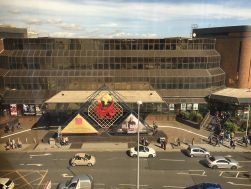 The hotel was a few minutes walk from the railway station and the Cardiff World Half Marathon Championships Expo was in a building right opposite the hotel. The race start was also just a matter of minutes away. I checked in and went immediately across the road to the expo. I had deliberately not brought my camera with me. Firstly because I had decided on an all out PB attempt and secondly because the predicted weather would prevent the camera from operating correctly anyway. Even if Victoria had run, I wouldn’t have been able to film her. However, I did have my phone and I couldn’t resist filming a few bits here and there. It’s not a proper Film My Run production. More like a little home video really. I collected my race number and wandered round a rather disappointing expo. I had been hoping to listen to some interesting seminars but annoyingly they were all sponsored talks. So the hydration and nutrition seminar was basically just some crappy company trying to push it’s products. I had already missed the Paula Radcliffe Q&A and Mo Farah saying hi to the crowds. I did, however, see a few guys from the British Team and managed to get them to say something on camera for me. It was a little comedy trying to get them all to speak in time together, but we got something useable! Dewi, Matt and Callum seemed like nice enough chaps and with half marathon times of around 66 minutes that would be the last I would see of them! I then decided to take advantage of the discount wristband I had been given in my expo goodie bag. I sourced a restaurant offering said discount, found it on the map and walked over. I ordered a lovely big chilli pizza and Coke at The Stable, which I paid for and consumed. Only afterwards did I realise I’d completely forgotten to get the discount. I’d only had the wristband on a couple of hours and it was a bit too tight on my arm. In disgust and annoyance I ripped it off and binned it. A stroll through the park and a long hot bath calmed me down. I had a light meal in the hotel and was in bed by 9pm. One benefit of being on my own was that I slept like a log for 10 hours. No kids coming in at 6am. No wife rolling over to cuddle me. With the race start not until 2pm and breakfast served until 11am, I didn’t even need to set an alarm. Awesome. As predicted, when I looked out of the window on race morning, the skies were dark. After breakfast, I got my running clothes on and ventured out for a gentle 3km leg loosener. 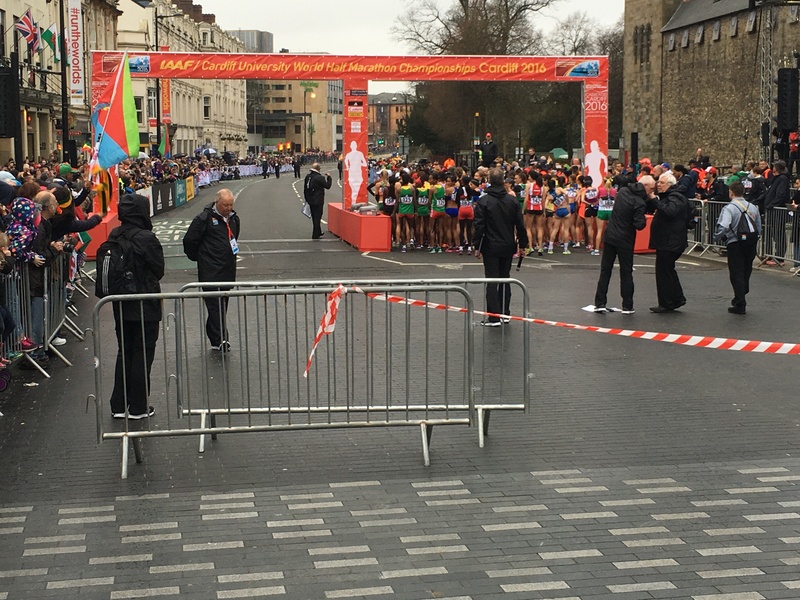 I ran up to the start line, past Cardiff Castle and along the race route for a kilometre before turning back. Setting up was in full swing and crowds were beginning to gather. 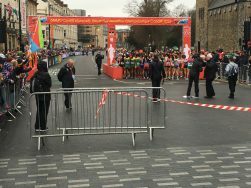 The IAAF World Half Marathon Championships were first held in Newcastle-upon-Tyne in 1992 and were an annual event until 2010 when it became biennial. It has been held as far afield as Mexico and China, but is most regularly held in Europe. 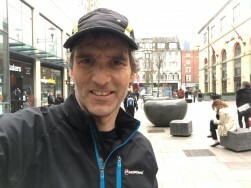 During my wanderings around Cardiff and in the hotel, there were regular sightings of people in official tracksuits with their country name on the back. As well as the British Team there were home nation teams and the England team was in the same hotel as me. I took my time getting ready. I decided to ditch my trusty X-Bionic top and just go with the club vest, like a real athlete! I am often far too covered up and it’s about time I embraced the vest and manned up in the cold. I also figured if it was going to rain I wanted as little clothing weighing me down as possible. I had purchased a tiny bottle in to which I put some flat Coke which I planned to drink at three points during the race. As I left my room I was carrying a 4 pint carton of full fat milk, and a bottle of Coke. Stood at the entrance to the lift was the England Team Manager. He looked at my Coke and my milk, looked at me and all I could utter was “standard race hydration?”. He laughed, but I think it was a laugh of pity more than anything. I made my way up to the castle and the start area. My predicted race time of under 1:30 put me in the third holding pen behind the elites and the sub 1:15 runners. It was very exciting, even more so than the London Marathon and the Great North Run. We were about to run in a World Championship race with Mo Farah! Sebastian Coe said a few words, a Welsh choir sang, trumpeters trumpeted, BBC TV went live, the elite women were off and then it was our turn. Although I was very near the front, I couldn’t see Mo or any of the other elites at all. I removed my plastic poncho, set my watch and ten seconds after the gun went I was crossing the start line. My goal was simple. Do the first 10k in 40 minutes and hold on from there. I knew I could probably get a PB, the question was how much I could shave off it. My club mate Thomas had recently run the Brighton Half Marathon in 1:25 something. Now, the ‘something’ here is very important. Although Tom had told me his time, I couldn’t quite remember. I had an inkling it was 1:25:20. In conversation on Facebook I had agreed with him that I would give it a go. I needed to do two 40.5 minute 10k races and then bang out one last 4 minute kilometre to beat his time. Of course I got caught up in the rush at the beginning and my first kilometre was 3:50. I settled after that and knocked out a decent first 10k in just over 40 minutes with fairly even splits. To be honest, the route was pretty dull. Apart from the odd highlight like Cardiff Bay it was standard streets and houses all the way. I opened my tiny bottle of Coke at 6k and it fizzed all over my hand. So much for it being flat! I had a quick swig. It was at around 8 miles, after my second swig of Coke, that the heavens opened. For a good ten minutes it absolutely threw down. Big, thick, heavy rain. It wasn’t horizontal like at the Portsmouth Coastal 50k but it was torrential. 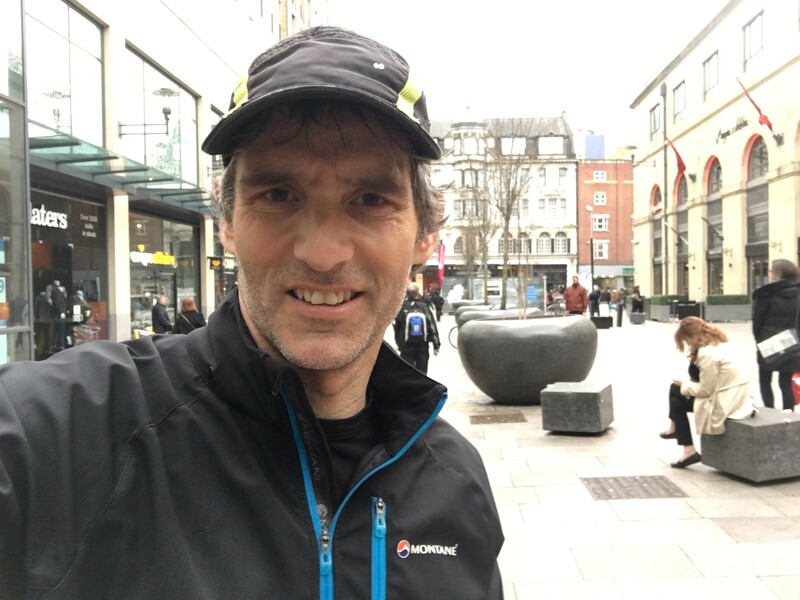 I was still clinging on to 4 minutes per kilometre and passed 10 miles, 2 minutes faster than I have ever done before, in 1 hour and 4 minutes. With 5k to go I had the wind in my face and there were a couple of sneaky inclines. I finally started to lose my hold on pace. 4:14, 4:11, 4:11. Managed to sneak a 4:05 in there before another 4:12 at kilometre 20. It was hurting but I could see club mate Tom’s time hovering there in the distance. When it gets down to a few seconds then any extra metres start to count. I had been using the watch but also keeping an eye on the distance markers in the street. My watch ticked over to 21 kilometres a long way before the finish line. I sprinted as fast as I could but I knew I had just missed 1:25:20. 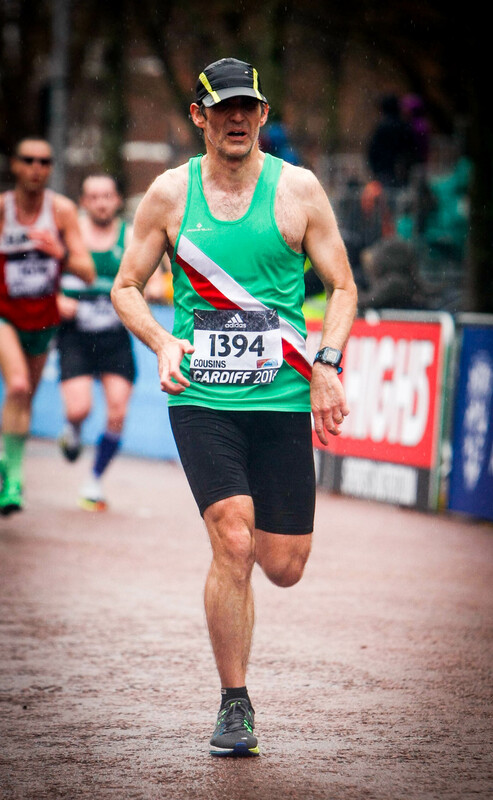 Still when I crossed the finish line I also knew I had a massive PB in the bag, coming in well under 1:26. I got my soaking wet phone out of my back pocket. My wife had been following my progress on the Cardiff World Half Marathon Championships iPhone app and on the Find Friends app. As soon as I looked at my phone there was a text from Victoria. “You’ve beaten Thomas” it said. No I haven’t, I thought. I collected my medal and t-shirt and made my way back to the hotel to change. It wasn’t until I phoned Victoria later that I discovered Tom’s time at Brighton had been 1:25:40. Hilariously I had crossed the line quite randomly in 1:25:39, beating Tom by 1 second. We had a good amount of banter about it on Facebook afterwards. Honestly, I would not have been disheartened in the slightest had I not beaten Tom’s time. I was very happy to have knocked 2 minutes off my previous PB. Furthermore, I have to thank Thomas because if he hadn’t pulled such a fantastic time out at Brighton I might not have been inspired enough to attempt to run a 40 minute first 10k in a half marathon. Just shows what you can achieve when you try. Once changed I spent a long time in Starbucks drinking vast amounts of coffee before the arduous train journey back home. The scenery isn’t nearly so nice in the dark. All in all a very successful weekend’s work at the Cardiff World Half Marathon Championships. 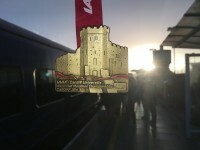 New 15k best time, new 10 mile best time, new 20k best time and shiny new half marathon personal best. Mo Farah came third to some incredible Kenyan running. I came 522nd out of 12068, which puts me in the top 5% and 24th in my age category out of 908 runners which is in the top 3%. Pleased with that.